Color: Blue and yellow with violet and/or gray undertones. Cleavage: Distinct in 3 directions. Pleochroism: Trichroic � very strong (yellow to dark blue-violet to pale-blue). Cutting: Orient for color. Large stones are usually too dark. 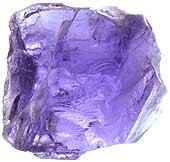 Iolite has fairly strong cleavage in one direction and fractures along this plane are common. Keep this cleavage 7 to 10 degrees off of the plane of the table. The other cleavage planes usually don�t create problems, but occasionally cause difficulties in polishing. Polishing: Cerium oxide or alumina on common polishing laps.